How to Get Traffic for Social Media Pages? or Earn money? How I Get Likes/Followers/Traffic ? There are 4 different ways to earn points. #1 Earn Points by Buying Them. If your time is important to you then this might be the best option for you. You can purchase points by going to this page. All points purchased will be added to your account Instantly. We accept Bitcoin for payment, as well as other cryptocurrencies (please email). #2 Earn Points FREE by Following, Liking, etc. In order to earn points this way just click on one of the Icons at the top of this page. If you're wanting to Like Facebook Pages for Points then click on the "Facebook Likes" icon. You will receive a list of pages to interact with. The "Points" listed under each page is how many points you will receive for Liking that page. 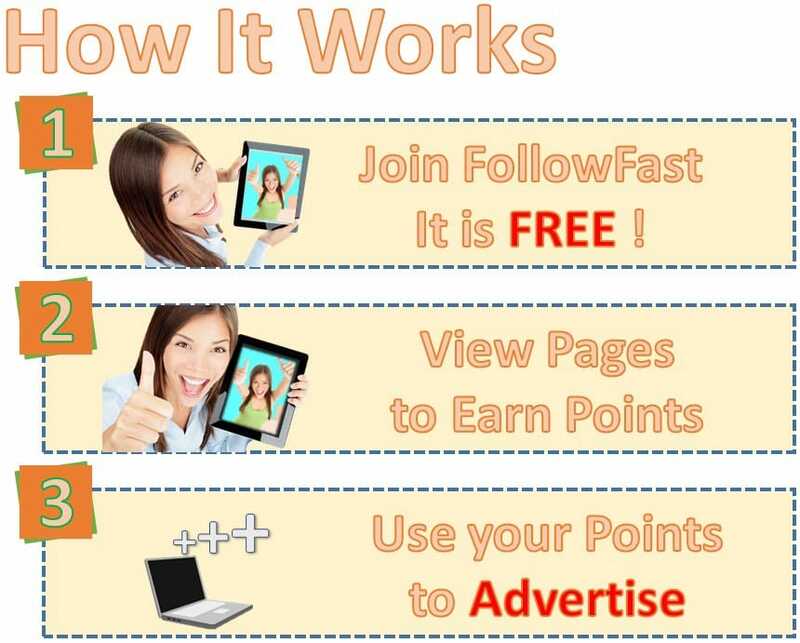 You can earn points for telling your friends, family or customers about FollowFast. Just use your "Referral Link" when sending them to the site. You will receive 100 Points for each person join under your referral + 10% of its profits that signs up to FollowFast. We also offer a daily bonus each day. You can earn this daily bonus just by logging in every day and doing some hits. How do I get Likes, Followers,..etc ? In order to get Likes, Followers etc you must have points saved up. You'll also need to have your account, page, etc added on your FollowFast account. To add your content hover over the section that relates to what you want to add (example If you want to add Facebook Page to get likes then click on 'Facebook Likes' icon at top of this page). then just click on "Add Facebook Page" tab. Once you add content to your account make sure to add some points on your site. 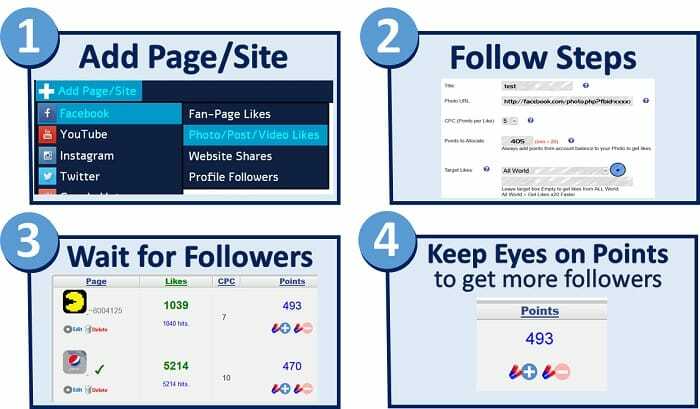 Points should be added on your sites, You will do not get fans when your page has No points, Even if you have enough points in balance. CPC is how many points you are willing to spend per like, follow etc. For example if you set CPC to 5 on a Facebook Page then you will spend 5 Points for each Like you receive. The higher your CPC is the faster you will gain likes, followers, etc. The lower your CPC the slower you will gain followers, likes, etc. Make sure to Add Points each time manually when points end for your page. It's also important to note that VIP Premium members can set CPC Higher than standard members.